Nuclear Medicine is a branch of diagnostic imaging that uses very small amounts of radioactive materials, or radiopharmaceuticals, to diagnose and sometimes treat disease. 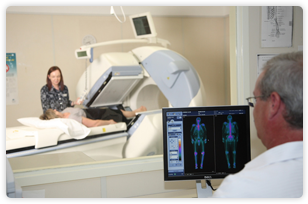 Radiopharmaceuticals are substances that are attracted to specific parts of the body. This specialty is unique in the fact that it records information regarding organ function and structure, as opposed to x-rays, which are based on anatomy. Nuclear Medicine may be able to detect conditions earlier than other tests due to its functional basis, therefore permitting more effective treatment. Recent advances in technology have resulted in the availability of new nuclear medicine cameras (called SPECT/CT) that combine a state-of-the-art nuclear medicine camera with the ability to perform low dose CT. This allows fusion of structural and functional information in the one study and has greatly increased the diagnostic usefulness of this discipline. 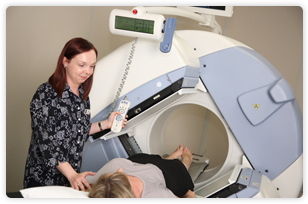 SPECT/CT is available at our Joondalup Health Campus, Midland Public Hospital, Bentley Hospital and Mount Hospital branches. After administration of the radiotracer the patient will need to wait a certain amount of time to allow the tracer to be taken up by the area of interest. For example; patients having a bone scan will need to wait two to three hours after administration of the tracer before they can be imaged. In some procedures, the tracer is taken up rapidly by the area of interest and imaging can be performed shortly after the injection. Our staff will advise you on your appointment times. For other, less commonly performed examinations, such as Colonic Transit, Gastric Emptying, Oesophageal Transit and Leg Lymphscintigraphy studies, please contact one of our nuclear medicine clinics for details. Are there any side effects from the radiopharmaceuticals? Nuclear medicine studies are safe. The amount of radioactive tracer administered is very low, and is usually less than the dose received with a CT. Babies and young children routinely undergo nuclear medicine studies. The most common type of radioactive material used in nuclear medicine studies (Technetium-99m) has a short half-life and rapidly loses its radioactive properties. Please do not hesitate to contact us if you have any concerns. No preparation is needed. The test is performed in two parts. The first part will take approximately 20 minutes: you will be given an injection and some images may be taken. The second part of this test is usually performed 2-5 hours later and will take up to 1 ¼ hours. No preparation is needed. The lung scan is divided into two parts. The ventilation study assesses the air flow into the lungs. The perfusion study assesses the circulation to the lungs. The whole test will take 1 hour. You must not have taken thyroxine tablets, kelp, or iodine (e.g. in multivitamin and mineral preparations), in the last 6 weeks. You must not have had an x-ray test involving injections of dye (contrast media) in the last 6 weeks. If you are currently taking thyroid medication please contact the nuclear medicine staff prior to your test. The test will take approximately 1 hour. Imaging is done in 2 parts, the second part is performed 3 hours following the first part. Do not eat, drink or smoke 4 hours before the test. No tea, coffee, chocolate, cocoa, cola or other caffeine products 24 hours before. Take your medication as usual on the morning of the test unless instructed not to do so by your doctor or the nuclear medicine department. If you are scheduled for an exercise heart test, wear appropriate clothing for walking or running. Leave your jewellery at home. If you suffer from diabetes, please bring your blood glucose meter. This test aims to assess the blood supply to the heart. The exercise heart stress test is performed on a treadmill or stationary bicycle. An injection of a drug is used to exercise the heart for the dipyridamole heart stress test. No preparation is needed. There are several different types of tests for the kidney, which will take approximately 1-2 hours. If you are booked for a Renal Captopril scan you have to fast for 4 hours. A DMSA test will require 2 visits on the same day. No preparation is needed. An injection will be administered to the affected breast usually around the areola (or near the melanoma site). Imaging will commence immediately after the injection on the affected side or site and will continue until the sentinel node appears on the scan. You may be positioned in several ways to get good images of the node. The position of the sentinel node will be marked on your skin with a surgical texta so the surgeon knows the position of the node. An intravenous injection will be performed. You will be given a time to return, usually in 48 hours. The Gallium scan will take between 1 and 2 hours. Please remember to bring all previous x-rays and imaging investigations with you to your appointment.